Nikki Gonzales has served Round Rock ISD as a Trustee since November 2014. A Round Rock resident in the Brushy Creek neighborhood since 2004, Nikki has a daughter at Cedar Valley Middle School and an adult son who attended Round Rock ISD schools. 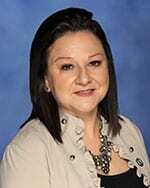 She serves Texas State Technical College as the Director of Operations for External Relations since 2012 working as a liaison between state lawmakers and TSTC. Prior to joining TSTC, Nikki worked at the Texas Capitol as a staff member and Chief of Staff for state legislators for 14 years. As an active community member, Nikki has been a member of the PTA since 2009, a volunteer in the Victim’s Assistant program for the Williamson County Sheriff’s Office, and an active member at St. Williams Catholic Church in Round Rock. She earned a bachelor’s degree in Criminal Justice from Southwest Texas State.